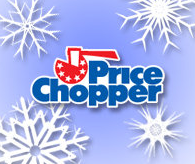 Price Chopper Weekly Coupon Matchups 2/22-2/28! on page: 9: Pork Chop Combination $1.49 lb., Nisson Ramen Noodles 12 pack $1.99, $1 off Purex Detergent 128-150 oz. or Ultra Packs, Charmin Double Roll 12 pack $6.99, $1 off Kraft Mayo 22-30 oz. Certified Angus Beef Eye Round or Bottom Round Roast - $4.49 lb. PC Assorted Pork Chops - $1.99 lb. PC Jumbo Leg Quarters savings pack - $0.99 lb. Red Pears - $1.99 lb. Gala, Granny Smith Apples or Fuji Apples - $1.69 lb. Washington State Organic Gala, Granny or Fuji Apples - $1.99 lb. LOL Sharp Cheddar Blends - $5.99 lb. D&W Oven Roasted Peppered or Maple Honey Turkey Breast - $8.99 lb. D&W London Broil Roast Beef - $10.99 lb. PC Provolone - $5.99 lb. PC Corned Beef or Pastrami - $9.99 lb. Update: per PC Yoplait Yogurt was included by mistake in the ad and doesn't count towards the gas cat so check your receipt and go to customer service to get the gas cat credit. Get a bonus Bags2Riches ticket when you buy any 10 select 10/$10 items below in a single transaction. Maximum of 12 total tickets per transaction. Where is the target coupon? I checked the website... guessing it is either someplace else or NLA? If you don't see it it's probably nla, which one is it? Went to PC yesterday and attempted to do the General Mills $.30 off deal on the back page of the flyer. None of the Yoplaits counted and I wasn't instantly credited due to running short of the required $25 purchase. At Cust Svc, I was told the Yoplaits weren't supposed to be included and it was a misprint. Was told there was a sign by the Yoplait saying such (I didn't see it). Was credited the $.30 anyway, but just an FYI. Ok, it looks that that one is nla, I'll update be post - thanks! I found a Healthy Living Coupon for $10 off $50 on Local Flavor (it's affiliated with Double Take Offers)that I think can be used as a competitor coupon at Price Chopper. Erin, were you able to find anything out about the Yoplait not being included in the General Mills gas deal? When I went today, I did take note of the sign. It said there was a misprint and the Yoplait should have read, buy 10 get $.10 off a gallon. It also still counts as the 10 items toward a bonus Bags2Riches ticket.